We have selected 10 cheap hotels in Geneva - Low prices but good comfort for a perfect stay in Geneva - The rates have been negociated and may be discounted up to 60%. Geneva also offers, like all the European largest cities, a large choice of cheap hotels and hostels - We decided to only select the ones offering a good standing - Of course the service is not the one of a palace but booking your stay in one of our selected budget accommodations is a garantee of comfort. For example the Bernina Hotel Geneva is proposing a warm and welcoming atmosphere to its guests ... Its decoration is really "design" but not cold. 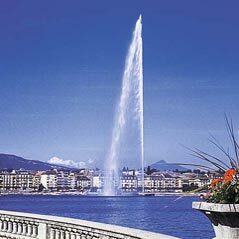 Bright and clean rooms for cheap prices - A good hotel adress downtown Geneva.. Thank you for your visit - Enjoy your stay in Geneva. We have reviewed and selected 10 charming hotels- We hope that our Geneva cheap hotels reviews will help you in choosing the apropriate place to stay... If you want to tell us about your feeling and impressions about one of the listed properties - Please send us an e-mail.